Launched in December 2007, Pazflor is currently the largest project operated by Total. It is a major development for Angola, and after first oil in the second half of 2011, it will increase the country's production by approximately 220,000 barrels per day. To produce Pazflor's heavy, viscous oil, a number of daunting technological challenges must be met, including the installation of gas/liquid separation systems on the seabed, a technological world first. The Pazflor FPSO, located around 150 kilometers offshore the coast and 40 kilometers northeast of the Daiia field, in water depths ranging from 600 to 1,200 meters. The remarkable Pazflor adventure started with the advent of the millennium. In 2000, Total's exploration teams scored another success in Angola's Block 17, a deep offshore license in the Gulf of Guinea, with the discovery of the Perpetua reservoir. Acacia and Zinia were uncovered in 2002, followed by Hortensia in 2003. Pazflor encompasses all four reservoirs and covers an area of over 600 square kilometers - six times larger than Paris - at a water depth of about 1,200 meters. Formed approximately 25 million years ago during the Oligocene epoch, Acacia contains light, good quality oil, similar to that of Girassol. The Perpetua, Zinia and Hortensia reservoirs are more recent, formed some 5 to 7 million years ago during the Miocene epoch, and their oil is heavier and more viscous, making it more difficult to produce. We decided to combine the production of these two very different oils, in keeping with our ongoing aim of optimizing the production of deep offshore resources. The choice was an ambitious one for a project of this size, encompassing two different subsea production systems tied into a single floating production, storage and offloading (FPSO) unit. One of the 49 subsea wells supplying the floating treatment, storage and offloading (FPSO) unit for Pazflor in Angola. Oil extracted from reservoirs is never "pure," but mixed with gas and water in varying proportions. It also changes over the field's production life. The Block 17 fields brought on stream before Pazflor were developed using subsea production wells. The effluent is carried up to the FPSO on the surface, where it is processed to separate the oil, gas and water. On Pazflor, however, an audacious solution is being deployed: for the three Miocene reservoirs containing heavy, viscous oil, the gas will be separated from the oil and water on the seabed, at a depth where human intervention is impossible. Three subsea separation units, each weighing a massive 1,200 metric tons, will be installed at a depth of more than 800 meters. Once separated, the oil and water will be forced back to the surface using powerful pumps specially designed for Pazflor, also installed on the seabed. The lighter gas will rise naturally to the FPSO. These subsea modules are critical to production and are designed to operate for a 20-year period. They are the result of intensive R&D programs, including numerous qualification processes to ensure equipment reliability. Unprecedented in scale, Pazflor's subsea separation system is a technological world first. We are leveraging our extensive deepwater experience and robust, tired and tested technological solutions to produce Acacia's lighter oil. The subsea production wells are connected to production lines, forming a loop - a configuration that is now standard in the deep offshore - and the subsea network is tied into the FPSO by two immense flexible lines, known as integrated production bundle risers (IPB risers), a design previously used on Dalia. The Pazflor FPSO is currently under construction in South Korea and will be the first of its kind to process two very different grades of oil. Nearly 120,000 metric tons of steel will be used in the construction of this leviathan, one of the largest FPSOs ever built. The onboard equipment includes gas turbines rated at a record 120 MW - enough to supply a city with some 100,000 inhabitants. 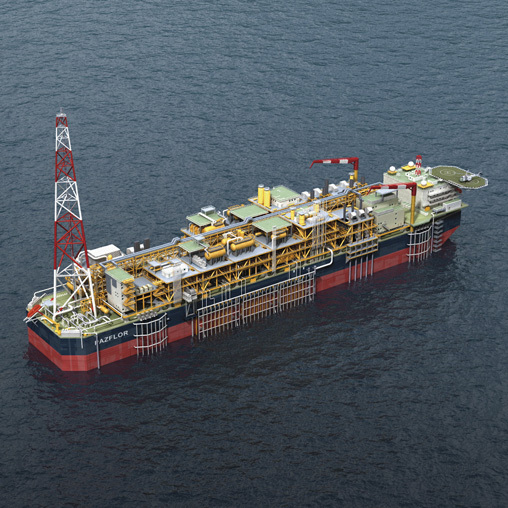 The FPSO, our third on Block 17, will be able to process 220,000 barrels of oil per day and store 1.9 million barrels. 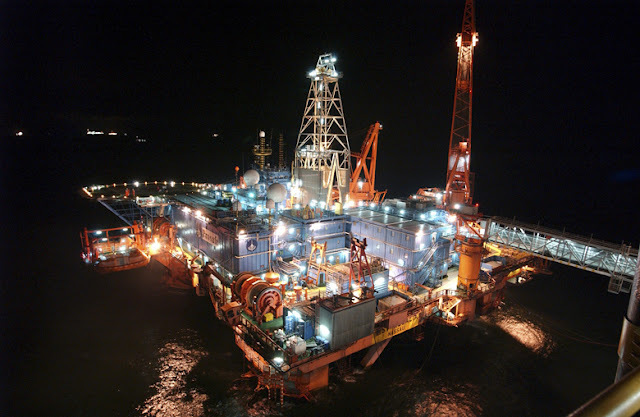 Night view of a platform on the Rosa field in Angola. Designing and building the equipment required to develop Pazflor marshaled the know-how of hundreds of people at dozens of industrial sites worldwide. Our aim is to successfully unify all these teams and harness their competencies to achieve the goal of first oil in the second half of 2011. From Geoje Island in South Korea to Houston in the United States, via France, Norway, Scotland, Mexico and of course, Angola, thousands of men and women are pouring their efforts and expertise into this huge project. By way of example, 7 million man-hours will be needed for the FPSO alone. True to our commitment to working in partnership with Angola, Pazflor is a major driver in the development of the country's oil industry. By also helping to train Angolan technicians and management personnel in forefront deep offshore technologies, the project is a natural continuation of the mutually beneficial relationship between Total and Sonangol, Angola's national oil company. Safety is the undisputed priority in tackling the potential risks inherent to a development of this scale. This is achieved through continuously heightening risk awareness through team coaching, so that everyone at every level understands and embraces their responsibility. This core concern is coupled with a commitment to respecting the environment. A census of the deep offshore marine life on Pazflor and an environmental impact assessment (EIA) were prerequisites for project kick-off. To limit the project's environmental footprint, the associated gas produced with the oil will not be flared, but rather reinjected into the reservoirs or exported to a planned Angolan liquefaction plant; production water will be reinjected into the Miocene reservoirs; and highly efficient gas turbines will be used. Located 150 kilometers offshore Angola, Pazflor comprises four reservoirs covering an area of 600 square kilometers, lying under 1,200 to 2,100 meters of sediment in water depths of 600 to 1,200 meters. The FPSO is 325 meters long, 61 meters wide and 32 meters high. The living quarters can accommodate 140 people. Pazflor's production plateau will be 200,000 barrels per day. 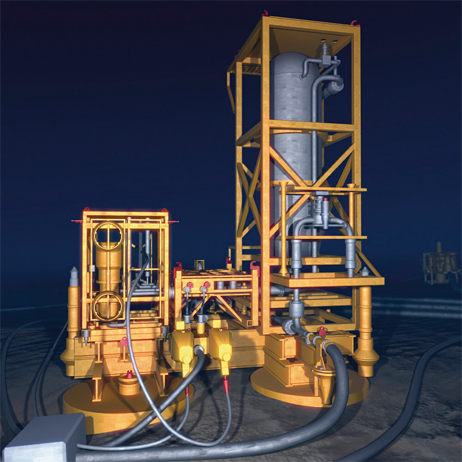 The two subsea production systems encompass 49 wells (25 producers, 22 water injectors and two gas injectors) and three subsea separation units connected to six pumps. Some 175 kilometers of pipeline and 90 kilometers of control lines, or umbilicals, will snake across the seabed.